Rat clone, I just won one for �8.50. Don't need another pedal. it has a switch... Rat and turborat maybe? Might be pretty cool for the price. I definitely now want one. I'm sure it sounds decent (I had a little Mooer one that sounded great), but I'm guessing the footswitch and jacks will be kinda lousy. Just picked this up from the delivery center, looks good feels solid... More reports later. They're labeled, vintage/turbo/dirty as with most switchable Rats. ProCo had a high-gain RAT called the "You Dirty RAT!" at one point which the "dirty" circuit is. On the ProCo RAT Deucetone both channels have a 3-way switch like that but on one side is a "clean RAT" to counter the dirty mode. 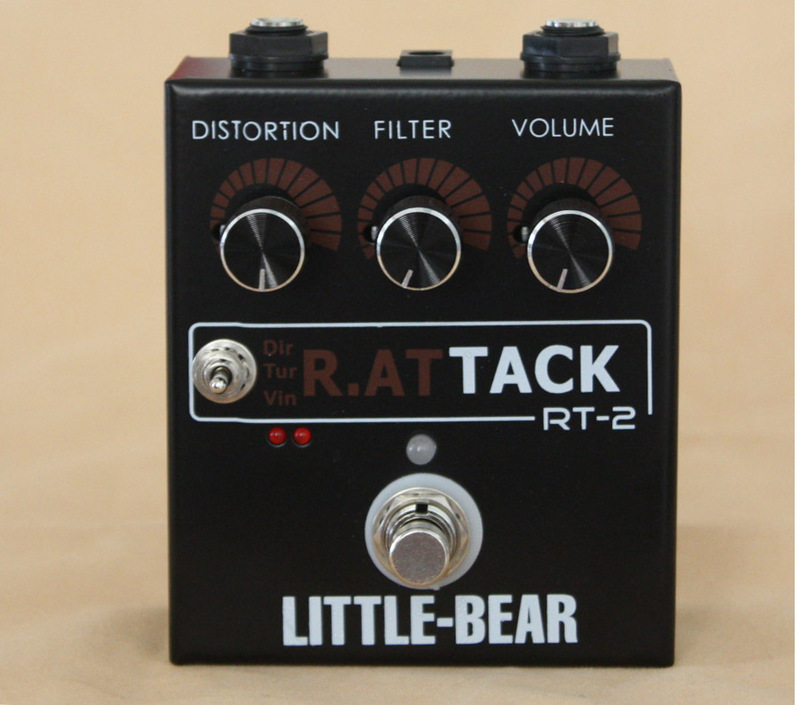 Very useful pedal with the switch, I considered picking one of these Little Bear pedals up last time they showed up on shortscale to clear some space on the pedalboard but strangely enough they are at times prone to selling for as much/more than a real RAT which was all I could find them for at the time. Been seeing where this fits in my world and the answer is on my bass board... Sounds absolutely huge, the filter knob lets you dial in some real sweet spots on teh bass frequencies. Shall be giving it it's live debut at the weekend to see if it takes the place if my BOD. So gave this it�s live trial last night sounded huge filling loosening huge, wont replace my BOD as I like it better for more subtle OD but for heavier stuff it was great. Also took my new Laney RB1 ran the � inch jack from the Sparrow DI in to it and put it on a table at the side of me, using it as a sort of personal Bass monitor then sent the Xlr to the front of house as normal� made a difference to my playing not having to rely on the sound guy to hear myself, and it chucked out enough good sound for the job all in all was rather pleased with my small but expanding bass rig.